France is now in the process of attempting to sell the carriers to a new buyer, with Egypt said to be the leading prospective buyer. Along with Egypt and India, several other countries had signaled their interest in the amphibious assault ships. The buyer would also be offered to purchase the Russian-made Kamov Ka-52K helicopters tailored specifically for the ships. 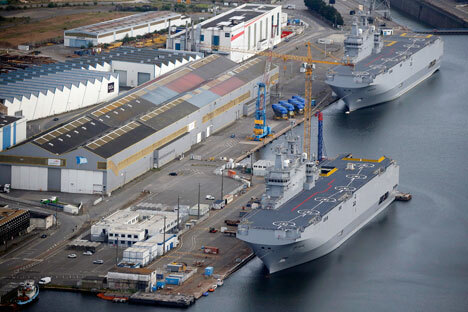 A French official cited by defense news website Defense One said that Moscow has signaled that Russian telecommunications and missile control systems installed onboard the Mistral helicopter carriers may not be removed, if Egypt or India were to purchase the warships. The unnamed official indicated that Russian officials had "let it be known" that Moscow "could accept India and Egypt receiving the equipment" if either of the two countries were to buy the ships, originally ordered by Russia in 2011 in a botched deal which has since forced Paris to refund Russia €949.7 million over the contract's cancellation. The official also suggested that if the equipment were to remain onboard the ships, it would help Russia to keep close links with Cairo. Some €56.7 million of the refund amount had gone toward covering the Russian-made equipment on board the ship, as well as training. Earlier this month, Russian officials announced that Moscow and Paris would hold talks on September 21 over the dismantling of Russian equipment aboard the warships, noting that the Russian-made components would be dismantled and returned to Russia by late November. France is now in the process of attempting to sell the carriers to a new buyer, with Egypt said to be the leading prospective buyer. Last week, French officials announced that a deal with Egypt "is among the serious options" for the ships' sale. As the Wall Street Journal had explained late last month, if Cairo were to purchase the ships, it would give Egypt's navy "some of the most advanced pieces of equipment in the arsenal of a Middle Eastern military," with the ships capable of transporting hundreds of troops, 16 helicopters, tanks and armored vehicles, and featuring a command-and-control system capable of directing these forces in battle. Along with Egypt and India, several other countries, including Brazil, Malaysia, Saudi Arabia, Singapore, Vietnam and the United Arab Emirates had signaled their interest in the amphibious assault ships. According to unconfirmed reports, the buyer would also be offered to purchase the Russian-made Kamov Ka-52K helicopters tailored specifically for the ships. Egypt has recently signed an agreement with France to purchase $5.2 billion in military equipment, including a frigate, four Gowind corvettes and 24 Rafale fighter jets, as well as arms from missile manufacturers MBDA and Sagem. Cairo is in talks with French officials on the purchase of two more corvettes. India, meanwhile, is in talks with Paris on the purchase of 36 Rafales.